The holidays are over, and that means it's time to take down all of the festive decorations you meticulously arranged at the beginning of the season. While it may be tempting to throw everything in the nearest box and call it a day, that will only make your life more difficult when it comes time to do it all again later this year. Here's how to appropriately pack up all of your holiday supplies. "Cover each ornament with a piece of tissue paper." Chances are, many of your ornaments aren't just decorative, but also hold some sentimental value. You may have gotten a special tree decoration while on vacation, or a family member may have gotten you a fancy ornament as a housewarming gift when you first moved. Make sure all of them are safely tucked away and protected from shattering or chipping. While the original case is the best option for storage, you may have thrown that away years ago. When removing them from the tree, keep the hooks intact and cover each ornament with a piece of tissue paper. Lay them next to one another with an extra piece in between to act as a cushion. Finally, lay the most delicate ornaments on top so they don't break from the pressure. There's nothing a holiday decorator dreads more than unraveling a tangled pile of lights. Save yourself some trouble next year by packing them up appropriately. It may be a good idea to wrap them around something, like a long piece of cardboard, to keep them from overlapping and twisting into knots. Continue wrapping until the entire cord is secure, and tie together with a wire to keep it in place. If you have more room in your storage container, fill with soft items so the lights remain protected from the weight of heavier objects. While a fresh Christmas tree provides your home with a festive scent, it can be a messy decoration to clean up after - especially when removing it for the season. Once all of the ornaments and lights are taken down, try covering the entire tree with an old bed sheet. This will help contain loose needles that would otherwise fall and leave a trail on the way out. Since this is likely to stir up many irritating particles in the air, it's best to run an air purifier, like the Holmes® True HEPA Allergen Remover Air Purifier Tower. Doing so will help remove allergens like dust and mold that may have piled up on your tree and get released into the air when relocating it. If you don't have a station in your home specifically for gift wrap, place rolls of wrapping paper in a bucket and store it in the attic or basement. For smaller pieces that aren't attached to a roll, it may be best to use that for padding for delicate objects, like ornaments, mugs and plates. Simply discarding small pieces of wrapping paper is wasteful. Similarly, tissue paper can either act as more padding for fragile pieces, or it can be rolled up and placed inside of the wrapping paper roll. When storing holiday supplies, it's important to make use of every inch of storage. 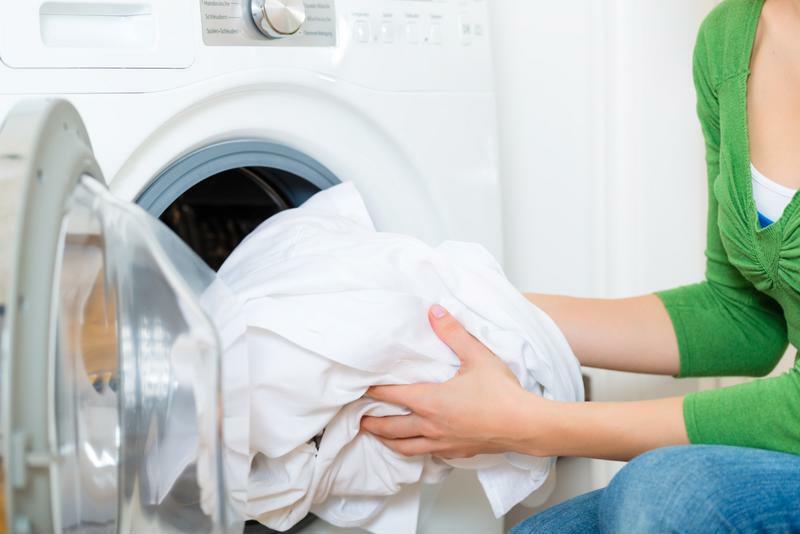 Wash linens before storing them away. Rather than pack away dirty items, you should wash linens, like tree skirts and tablecloths, before storing them for an entire year. This will help prevent bacteria from breeding and ruining the material. Plus, it will save you the trouble of washing it next year as you unpack each item. You don't have to stop with linens. After removing lights from outdoor shrubbery, wipe them down to remove any dirt or mold that may have built up over time. Also, shake out stockings and vacuum seasonal rugs before packing them away. It's important to store all of your holiday supplies in a way that will make sense when you're retrieving them the following year. To make life easier next winter, organize boxes by room. For instance, everything that belongs in the living room, like ornaments, stockings and decorative rugs, should be labeled as such and kept together. This will help you when you're unpacking and distributing heavy boxes to their appropriate spots.